With the New York Rangers season on the line, Derick Brassard certainly got the point, times five, helping give the Blueshirts a shot at making it to the Stanley Cup final for the second consecutive year. Down 3-2 in their Eastern Conference final series against Tampa Bay, the Rangers trounced the Lightning 7-3 in Florida, a triumph that included a hat-trick effort from Brassard. He also added two assists in the victory, giving him nine goals and 16 points in 18 post-season games this year. Brassard scored the game’s opening goal and netted the final tally, an unassisted marker with 1:41 left in the third period. STAT PACK: Brassard played 16:22, taking 10 shots on goal, recording a plus-five rating in 23 shifts. He also won seven face-offs. NEED TO KNOW: Brassard registered the first New York hat trick when the Rangers were facing elimination since Mark Messier accomplished the feat in Game 6 of the 1994 Eastern Conference Final against New Jersey. JOINING THE ‘GREAT ONE’: Brassard’s three goals represented the first Rangers hat trick in a road playoff game since Wayne Gretzky did it in 1997. MEETING OF THE MINDS: Head coach Alain Vigneault spoke with Brassard and Derek Stepan before Game 6 against the Lightning, where he delivered a pep talk to the two forwards. DERICK DELIVERS: With 13 points, six of them goals, in the 10 games the Rangers have played when facing elimination since last year, Brassard has been a major factor in New York’s success story. In fact, the Original Six squad is 9-1 in those games. TROPHY CASE, 2005 EDITION: In 2005, Brassard was named to the CHL All-Rookie Team, QMJHL All-Rookie Team, was selected the QMJHL Offensive Rookie of the Year and QMJHL Rookie of the Year, and also won silver with Team Canada’s U18 side. CAPTAIN BRASSARD: The Quebec native was a member of the Gatineau L'Intrépide, where he was captain of his midget team. A TOP 5 GUY: Brassard is second in playoff goals (9), fourth in plus-minus (9), fifth in power-play goals (2) and fifth in shots (51). HONOURABLE MENTIONS: J.T. 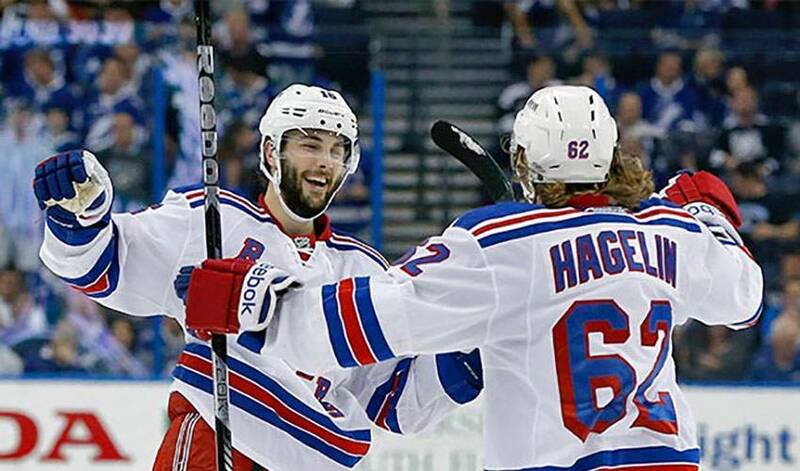 Miller and Rick Nash each had one goal and three assists for the Rangers. Henrik Lundqvist made 36 saves. Keith Yandle (1G, 1A) was a plus-two and had two blocked shots.